Gusset Tunic was published in knit.wear Spring 2014 issue. The original sample is kept by the magazine so I made one for myself. I used a yarn called fettuccine, it was on a cone and I got it from a yarn exchange with my machine knitting guild. I made it shorter than the original sample. I am 5' tall and the model is lots taller. Since it's top down I just ended earlier and this also cause the gusset to be shorter as there are fewer stitches to decrease to a point. That's what's great about top down knitting, flexibility. 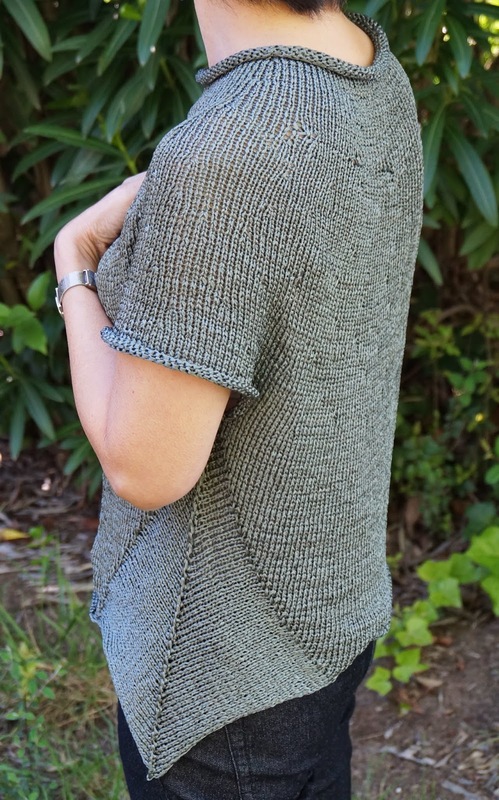 I knit this for one daughter-in-law, and she loves it; now the other one wants a similar one, but she needs it to be longer to cover her hips. I don't want the gusset to go way down to her knees; any suggestions about how I can lengthen it while keeping the gussett not too much longer? Glad your daughters-in-law like the design. I would suggest decreasing more often (instead of double decreases very other row in the center stitch of the gusset, maybe 2 out of 3 rows) to shorten it. Thank you, Alice!! Will try this. Hi there again! Well, I've started the short rows. Here's what I've done so far: I started the sweater at a size 39, and after I finished the arms, I increased to make it a size larger, 43 (236 stitches), also knitting about 18 extra rows, or about 3 inches. Now I've started the short rows. The aim is to make the tunic come down over her hips, without making the gusset go all the way down to her calves!! I've never altered a pattern like this before, so it's kind of daunting!! I'll be back in touch when I start the gusset!! What will be really cute is when I finish it, I'll post a picture of both daughters-in-law with their sweaters! Hi Alice, I selected your tunic because I love the idea of knitting in the round and knitting from the top down. I like the option of being able to make it a little longer if I have more yarn. I am new to knitting and I'm stuck on the first inc rnd. I am knitting the size 33 3/4. I have cast on 84 stitches and then knitted 3 rounds. If I have read the pattern correctly then there are no increases for this size in the next 3 rounds but after those 3 rounds I should have 88 stitches on the needle. What am I missing?